Did you ever feel you didn't quite belong? Not anywhere? Quite a lot of my life felt that way from a very young age being born a person who loves to speak and write. Last year, however, was the worst. I recently related to, ahem, a rat. I connected to him so well that I stayed up alone on a rainy night to watch him battle his way through devastating uniqueness to become a world renowned cartoon chef! Nope, I'm not kidding. All his talents and foibles seemed out of place. The little rat had troubles that built continually from the way his body reacted to scents and his mind raced imaginatively. He, like me, had talents that didn't fit in with his family and social set. He didn't want to do what everyone else thought he should. He wanted to be the unthinkable, a rat chef. I found that humorous and bittersweet. He, like me, had a physical gifting that led him to experiment with food. Okay, his was a super developed sense of smell while mine was a curve ball of a devastating diagnosis that led me to become super creative with food. After experiencing malnutrition and the inability to absorb food, I was diagnosed with a very severe form of colitis. I spiraled down into poor health and lost hope I would eat again without pain. I wondered how long I could hang on without absorbing food. I felt cut off from family and friends as every meal caused intense reactions. I began to avoid meals with my family and outside social activities. I avoided any situation that would put me near food and people at the same time because it was a perfect disaster. No one understood what was happening to me, including me. As the little rat fellow landed accidentally in forced isolation, I found myself feeling isolated through a situation that I couldn't control. But through a few amazing experiences, the little rat began to build a new life. And that is exactly what happened to me. I'd love to say it was all super natural and magical, but sometimes God chooses to work in simplicity. I think when He does that, we are most surprised. I know I was! I'd been praying for six months when my friend from church, Tod, suggested trying a different approach. All the research says to eliminate foods that bothered me. Unfortunately everything bothered me. My digestive track was inflamed. I was in constant pain and often privately in tears, doubled over. Tod prayed with me and he was given wisdom to share. He suggested I fast, drink electrolytes during the fast, allow my system to rest, and then start eating as if I was an infant. Now lest you think this is some ludicrous baby food diet, stop right there! We came up with what I call the Addition Plan. The simplicity is that after resting my system and balancing the electrolytes, I started eating only white rice. I had no idea if I could even hold food so I started with only a few bites. Then every couple of hours I added a few more bites. To me the fact that I held food without pain was a stunning miracle. So the idea was to add a new food one at a time, just like we've done with our infants down through the centuries. Every couple of days I added a new food. I journaled and wrote out recipes. By the end of a few weeks I had several healthy foods I could eat without pain or other problems. Any time a food caused pain, it'd be placed on my Difficult Foods List. All this experimenting seemed to match up with Ratatouille's kitchen disaster that created an amazing, critic-pleasing pot of soup. Once again my life had paralleled a cartoon rat! But I built up a really nice list of delicious recipes I could actually eat with my family and I knew foods I could eat out at social occasions. I felt like I'd gained back my joy and wanted to share it with others that might be going through the same experience. I created each of the recipes, photographed them, and wrote out all the tips I'd learned along the journey to regaining the joy of eating and sharing meals with people I care about. Voila! Creative Cooking for Colitis debuted in April. But a funny thing happened along the way. Other people wanted the recipes but didn't want to buy a book that said colitis on the cover if they didn't have an IBD problem. Hmm. So I went back to the drawing board. I kept hearing over and over how people thought I could make elegant dishes and they wanted to know how, but were afraid of the expense and difficulty. Yep, I found a solution. 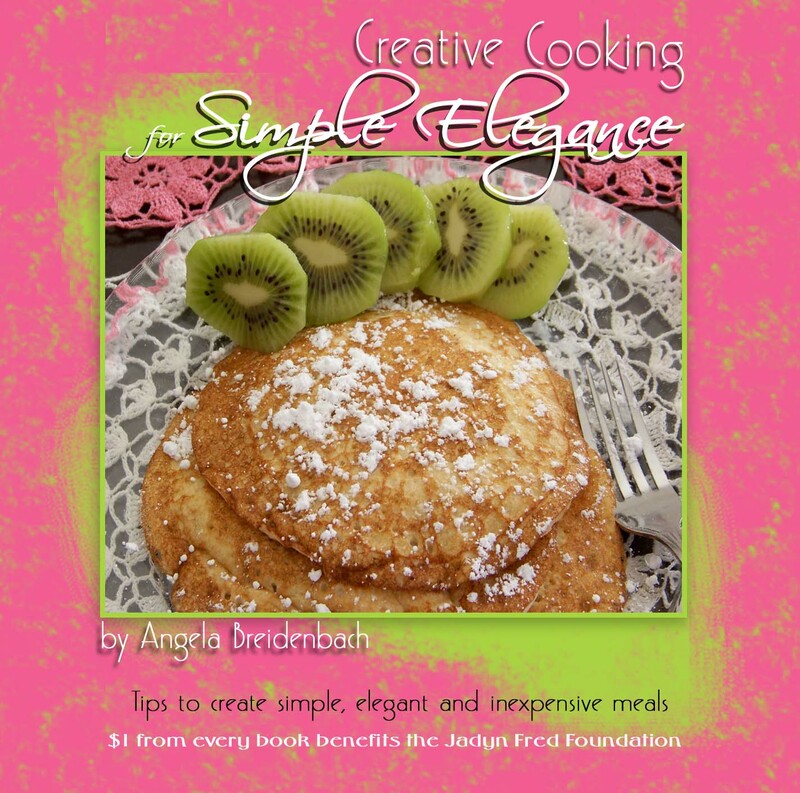 Creative Cooking for Simple Elegance debuted the beginning of June for people who want to create simple, elegant, and inexpensive meals. The tips in this cookbook are all about simplicity. Little cooking tips I've learned over the years as I cooked and baked for a very large family. So what is the spiritual lesson? Each of us is uniquely and wonderfully made. Each of us has difficulties that lead us down a different path than we may have suspected we'd travel and often didn't want to follow. (Poor Ratatouille raced through a rainstorm in a sewer to end up smack dab where he needed to be to become who he was intended to become.) I didn't want to travel the path of illness. I'm sure there's something in your life you'd rather not have dealt with either. But here we are. And here is who we are with what we've been given, good and bad. I chose to write some really cool cookbooks to fill an unusual niche with both the gift of cooking and curse of illness. You know what I found out? Some curses are really just a gift in disguise. Just like Ratatouille's enhanced ability to scent spices and freshness, I have an enhanced ability to understand other people's needs from what I've been through. I think it's a great gift from God to have the opportunity to bring joy back into other people's lives and I don't think I'd have found this part of my calling without having gone on the terrifying journey. It sure wouldn't bring me as much joy if I didn't understand the complete absence of joy. Have you traveled that path? The one you didn't want and found a special gift? What are you doing with that unexpected gifting? May your table be filled with joy! 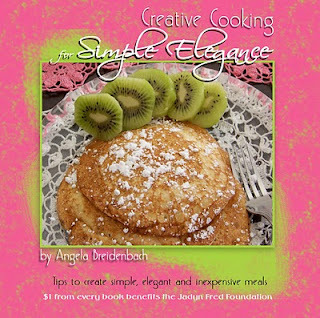 Angela Breidenbach is Mrs. Montana International 2009, a multi-award winning inspirational speaker and the author of the Gems of Wisdom women’s seminar series, the Creative Cooking Series including Creative Cooking for Colitis and Creative Cooking for Simple Elegance. She works with Hope’s Promise Orphan Ministries and the Jadyn Fred Foundation. Angela also teaches online classes and coaches one-on-one in courageous confidence, personal growth, and powerful living. She’s certified in mentor/peer counseling as a Stephen Minister and life coach. Angela serves as an assisting minister for Atonement Lutheran Church in Missoula, MT. She volunteers as the American Christian Fiction Writer's Publicity Officer. Not only did she walk the hard line of deciding to donate her mom's brain, but she is also on the brain donation list at the Brain Bank-Harvard McLean Hospital. She is married, has a combined family of six grown children, one grandson. Gems of Wisdom, the book and Bible study releases June 1, 2011 from Sheaf House/Journey Press. Giving away a free cookbook every 50 new friends! Thank you so much for hosting me today. I'm very honored to be here. I do have to mention that in any achievement there are always others that make it possible. My friend Julie of Cowan Creative is responsible for those beautiful covers on the cookbooks. She's such a talented lady. I just wanted to share how much I love and appreciate her and her talents. I also have to mention that moving forward in any career only happens because of the supportive people around you. Thank you, Gina Welborn, for being one of those friends that steps forward to help another friend. No one achieves anything all by themselves. There's always a team of amazing friends and family walking the path with you. Hi!! I came over to this blog and I said--there's Ang!! Love this post. It's really amazing what you can do when you step back and take in God. I love your cover for the book. And the recipes sound delish! Thanks, Angie for stopping by the Inkwell. I love your parallels with Ratatouille. I've been learning the hard way lately that God works more amazing changes in our lives through the valley experiences than through the mountaintop ones. But luckily no matter what the experience we are never alone. Angie, I enjoyed reading how God ministered to you through a word of wisdom rather than an instantaneous miracle. I think its important to be open to receiving healing any way God might choose to send it. I have a friend who recovered from lupus by completely changing her diet. Thanks for sharing your story. Angie, I went to bed thinking about your post and dreamed I put my family on a baby food diet. The worst thing is when Hubby and oldest son were in Italy last week, they took a picture of baby food on store shelves. I can't remember the fourth one but seems like it was as bad a horse. This is an absolutely precious post! Thank you for sharing your story with us. I think we can all relate in one or another to feeling isolated. How true the verse, "God sets the solitary in families." The very things that isolate us can be used by God to bring us into greater relationship and friendship with Him, and with others! A friend of mine was recently diagnosed with colitis. I think I'll share your cookbook with her! I have Crohns, which is a close cousin of Colitis and equally "Fun" to deal with though my case isn't quite as bad as your case is. You have my full sympathy. There are dishes I cannot eat unless I want to camp out in the bathroom all night long. If I overstress, I pay for it through reactions from my Crohns. None of my family ever understood (except my husband) what I was going through and often were the cause of the stress. I know a few people who suffer from colitis and Crohn's, and I hope they caught the link today to come over and visit. It's a pleasure to have your sunny self visiting us today. Anyone who has met you and didn't know this story would see your vivacity and health and joy of life shine through. The cookbooks are workin'!! Thanks for guesting with us, Angie. We missed you. Glad to see you. Oh dear, problems in bloggerland= not good! thanks for sharing your story; sadly it is not so uncommon but many people silently suffer, excusing themselves from family celebrations and dinners out with friends. I hope you soon find a regimen that brings you improvement. I think we must have been commenting at the same time this afternoon. I missed your comments. Yes, stress is an additional issue with these IBD conditions. So not helpful! I am glad to connect with you because you are so right about the isolation when other people don't understand. Thanks, Narelle, for battling through all the stuff that made it hard to be here. Lots of people would have given up, but you are a trooper! Hi Angie! I'm so glad you visited us today. I really admire your persistence in finding a way to deal with such a miserable illness. I love the book covers and the Ratatouille tie-in. Angie this was such a fun post! 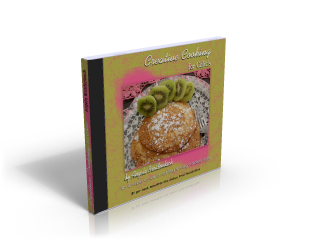 I love the way your cookbook turned out! I'm glad you've included lots of pictures. I tend to gravitate towards cookbooks with lots of visuals. Hi Suzie! Thanks for having me here. I appreciate the uplifting words too. Ratatouille just has me in stitches, especially when I can honestly say we have sooo much in common, lol. T. Anne, thank you! I love cookbooks with photos. I hate it when I'm making something I've never made before and have no idea what it's supposed to look like. That's why I had to have a lot of them in my book. Besides, it was really entertaining learning how to do food photography!